To achieve the longest-lasting protection, every factor of the environment must be evaluated and considered. These include: Abrasion, Impact, Chemical exposure, and type of “wear”, be it forklift or foot traffic. 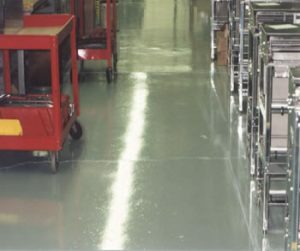 The Industrial Flooring Group features the most cost effective and versatile products that Duraguard has to offer for your Assembly facility or Warehouse. Vaporguard — A unique Industrial Flooring system designed to penetrate into the smallest fissures, sealing the concrete. It stops penetration of both liquid and vapor from passing through the concrete surface. Duraprime WB — A water-based and water-tolerant epoxy primer system for application over concrete substrates. This primer, which can be used as a primer under most of our systems, has excellent adhesion characteristics, even when applied over damp concrete surfaces. Durapoxy AP 100 — This 100% solids epoxy primer is typically used to promote adhesion and to seal old or new concrete. Specially formulated for use under our Top-Coat products, this product is suitable for damp or dry substrates down to 5°C (40°F). Durapoxy AB — A 100% solids epoxy polymer base coat system for medium and general use applications. When used as a primer under the appropriate topcoats, this product provides very good impact, abrasion and chemical resistance characteristics. Typically used for interior, dry applications, when combined with a broadcast aggregate Durapoxy AB offers and easily maintained, slip-resistant surface. Durapoxy TC — This is a topcoat system with excellent adhesion capabilities, which makes single or multiple coat applications possible. 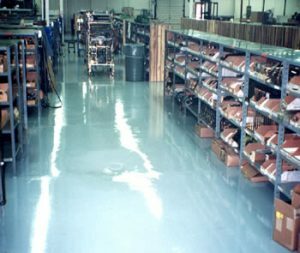 Depending on the Industrial Flooring project requirements, a topcoat can be applied, with or without slip-resistant texture. Durathane CR 56 & 64 — These polyurethane topcoats offer superior chemical & wear-resistance and will cure to a glass-like finish which produces excellent light reflective qualities.